Emily's Friends Rescue, inc hasn't added a story. Lena was dumped in a high kill shelter. Our rescue angel saw her there and took her home. She is very fluffy so we thought she was ok but once looked over we found out she was emaciated and anemic. We fed her and gave her as much TLC as we could. Today she had her babies. 2 died probably due to malnutrition : ( She gave birth to 6 live babies. The 9th got stuck in her birth canal thus Melissa had to rush her to surgery. Momma survived but the pup did not : ( We need help with the vet bills ! If you can help in any small way we would very much appreciate it!!! Emily's Friends Rescue, inc hasn't posted any updates yet. 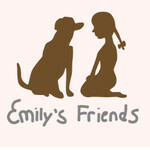 Emily's Friends Rescue, inc is managing the funds for this campaign.